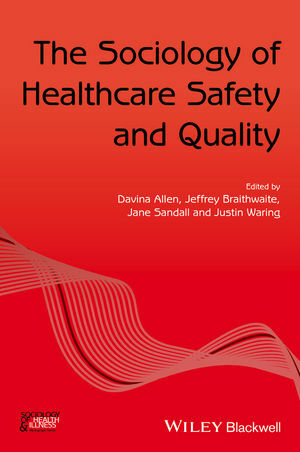 The Sociology of Healthcare Safety and Quality presents a series of research-informed readings on the sociological contributions of technologies, practices, experiences, and organizational quality and safety across a range of healthcare contexts. Davina Allen is a Professor of Health Care Delivery and Organization at Cardiff University, UK, a member of the Sociology of Health & Illness editorial team and Editorial Board member of the Journal of Health Services Research and Policy. Jeffrey Braithwaite is Foundation Director, Australian Institute of Health Innovation, Director, Centre for Healthcare Resilience and Implementation Science, and Professor of Health Systems Research, Faculty of Medicine and Health Sciences, Macquarie University, Sydney, Australia. Jane Sandall is a Professor of Social Science and Women’s Health and co-leads King’s Improvement Science at King’s College, London. Justin Waring is Professor of Organisational Sociology and Director of the Centre for Health Innovation, Leadership & Learning at Nottingham University Business School, UK.